UWorld is about to turn the world upside down when it comes to the idea that the MCAT is the biggest hurdle standing between you and your dreams of getting into medical school and becoming a doctor. Medical students across the world use UWorld to prepare for their medical licensing exams because they are the Gold Standard. Nothing compares to their qbanks and exam preparation. And you now have the chance to learn from the best test experts and question writers to crush the competition and earn a top MCAT score. As my mentor Dr. McDade who sat on the admissions committee at the University of Chicago Pritzker School of Medicine says, “The MCAT is a test you want to take Once and Only Once”! You do not want to have to retake the MCAT. Did you know the number one factor that goes into a medical school admissions decision? A medical school is going to receive over 13,000 applications for only 150 spots in their incoming glass. The AdComs cannot possibly review all the applications, so what’s a med school to do? They are going to use computers that screen based on minimum MCAT cutoffs. Meaning if you don’t meet their minimum MCAT score then you will be rejected. This explains why over 60% of first time applicants to medical school are rejected. It’s super competitive and your MCAT matters the most. If you don’t have the score nothing else in your application matters. Your objective and sole focus must be to ace the MCAT. You want to aim for a MCAT score of at least 510 or better because this is the average score of everyone who applies and actually gets into medical school. Unfortunately, each year this number is going to creep up as students get smarter and more test savvy. Here’s what you absolutely cannot do. Don’t try to go it alone in your MCAT preparation. Too often I see premed students who spend weeks or even months reading textbooks and not doing questions. They tell themselves, they are not ready for questions and don’t want to have a bad score. You want to do questions early and often to gauge your progress and figure out your weak areas. Don’t wait until you feel comfortable to start doing MCAT problems. Start your MCAT questions early. UWorld MCAT question answer explanation supported with images and text. So I told you how UWorld is the gold standard and that’s no joke. Although there are a ton of test prep companies and question banks available to medical students we consistently say UWorld is the absolute best. And I think you’re in for a huge treat having them for the MCAT now. This is a huge gamechanger and if I believed in the emotion of jealousy I would say I’m jealous for not having UWorld MCAT prep available to me as a premed student. But here’s how medical students study. We take our United States Medical Licensing Exam (USMLE) at the end of our second year just before we move into our clinical years which is all hospital based. The USMLE determines what residency and specialty we can pursue based on our scores so you can think of it as the MCAT on steroids. It’s that serious and then some. And have an exam covering all of that material along with physiology and basic anatomy of the cardiovascular system. To prepare for this organ system exam my classmates and I would use UWorld and do all of the cardiovascular questions before the test. We would do this for each organ system that we studied. This meant that by the time we finished class for the year and now had our dedicated study time we could go through the qbank another time and learn from the question bank in even greater detail so that we would be completely prepared for the USMLE. You want to do something similar when using UWorld for your MCAT prep except things will be a bit different since college curriculums are not as straightforward as what you will see in medical school. But I really want to hammer home the point that if medical students consider UWorld to be the Bible of test prep then it applies to the MCAT too. You cannot go wrong by having this qbank at your side in the field of medicine. Plus, now’s your chance to get in early on the question bank that you will be using throughout the rest of your career because to become a board certified physician you are going have to pass three USMLE’s. What Makes UWorld MCAT Prep Awesome! I cannot say enough about how UWorld is going to give you everything you need for a competitive MCAT score. The people who write the questions in this test bank are experts on all MCAT subject areas. They are only going to write questions that are comparable to what you can expect to see on your MCAT. Basically UWorld follows the mantra of prepare for a category 5 storm so that when you walk into your actual MCAT exam it’s only a category 3. I believe this is the exact approach you want to take to the MCAT. You want to be over prepared so that nothing catches you off guard on exam day although there are going to be things that appear on your MCAT that you just cannot expect. That’s just the nature of taking exams. Pro Tip: The MCAT is not a test of memorization. This is the Medical College Admission Test to determine if you have what it takes to become a doctor. Doctors do not simply memorize. They think critically, are analytical and have to solve unique patient presentations. If you cannot do this you will not be a good doctor. This is why there is so much at stake with your MCAT. Maybe in the past that was the case. But now with the UWorld MCAT question bank you are going to be fully prepared for the MCAT. Remember these are the people writing the questions for medical students and new doctors so they will give you this advantage early on as a premed a tool that you will need for the rest of your career. This new approach to learning is enough in itself to use UWorld MCAT because there is nothing else on the market that compares. And yes I’m fully aware of all the other test prep companies out there. But I ask you this, “If these companies are so good at MCAT prep then why do so many students not achieve the MCAT score they want?” simply having a money back guarantee does little to help you as a premed when AdComs will see each and every one of your MCAT attempts. You are in complete control of your medical future and it all starts with the MCAT. I would like to remind you that at this point your grade point average (GPA) is pretty much set in stone and the MCAT is really your last chance to prove to AdComs you have what it takes to get into medical school. Besides, you already know you are going to be screened by a computer based on your MCAT score too. One of the biggest advantages of UWorld MCAT is their question explanations. Remember how I told you the best way to prepare for the MCAT is by doing lots of questions? Well, the real learning actually comes when you go over your questions to determine why an answer choice was correct and why the other options were incorrect. You get the best answer explanations that you can find anywhere. 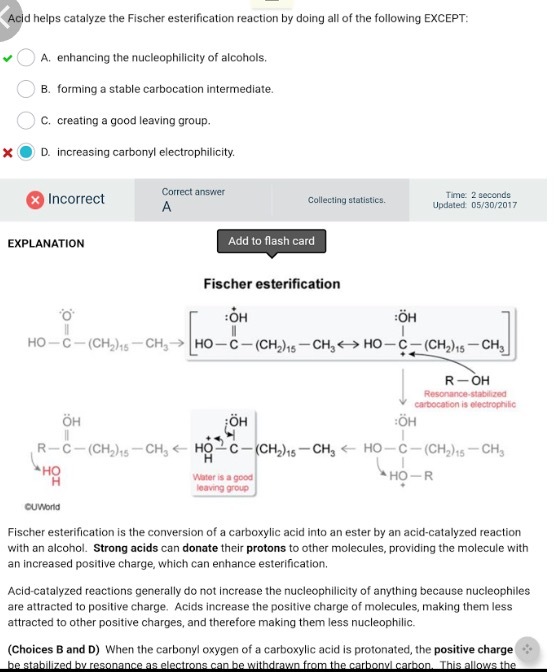 Uworld MCAT Organic Chemistry answer explanation for Fischer reaction. This means simply by doing questions but more importantly spending time reviewing your answers you will learn a ton. Plus, what you will review will stick with you longer since doing questions is considered an active form of learning which is much better than the passive activity of reading and re-reading your textbooks or class notes. I had a chance to review the answer explanations and they are phenomenal. Not only do you get thorough explanations of why one answer choice is the “best” but also why the others are wrong. To accommodate all learning styles answer explanations even include images and diagrams where appropriate. 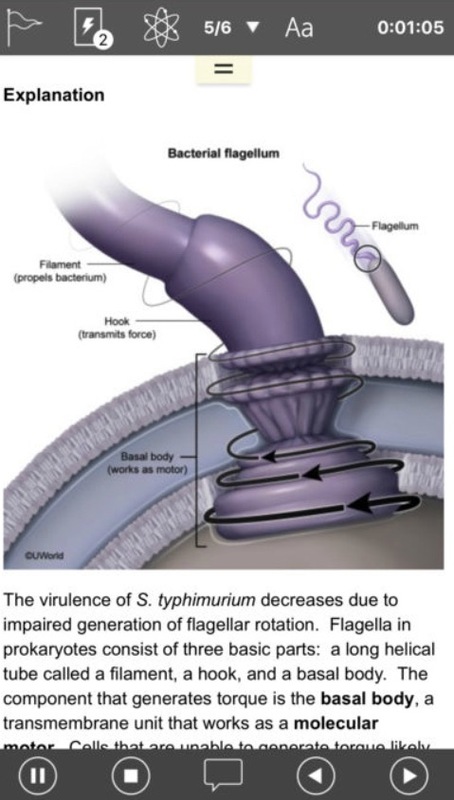 Once you start doing questions and things aren’t exactly clear you are really going to appreciate how the diagrams and images make things abundantly clear. Seriously it’s like a mashup of Wikipedia, YouTube and art all combined into one question bank so you get complete coverage of a topic. 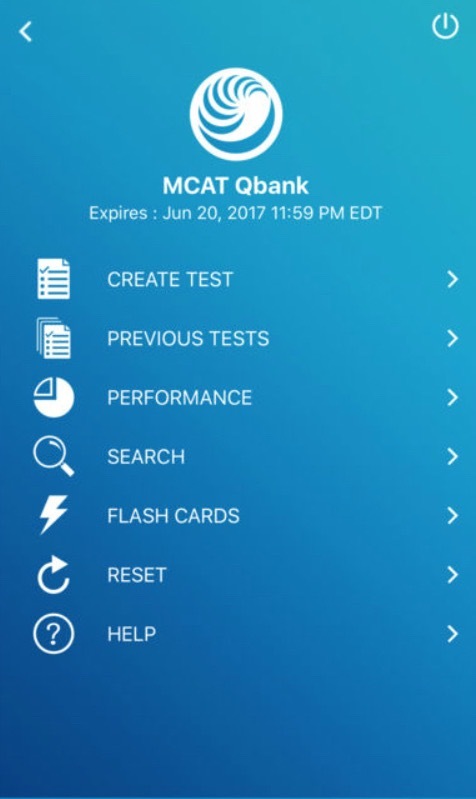 With over 800 MCAT style questions and more on the way this question bank is a must have for any premed student who wants to get into medical school. This question bank covers all of the topics found on the MCAT. Yes, this includes your achilles heel of CARS too. Nothing has been left for you to figure out on your own. Another advantage is the interface. Their question bank mirrors what you will see on the real MCAT. The design and layout is practically the same. This means as you continue to do questions, improve your scores you won’t be in for a rude awakening on test day in the form of the MCAT software looking different to what you had be prepping for over the last several weeks to month. Remember by the time you sit for the actual MCAT you want to mimic your test environment as much as possible and by having your question bank mirror the MCAT will make life a lot easier for you on test day. This applies to your MCAT preparation. UWorld has been doing something that will blow your minds as a premed student. They allow you to compare and track your performance to all other premed students using their question bank. This means you can gauge your readiness for the MCAT in comparison to everyone else studying for the MCAT. You have to remember that the MCAT is a standardized exam where you are actually competing against everyone else taking the MCAT which is why you get a raw score along with your percentile rank. 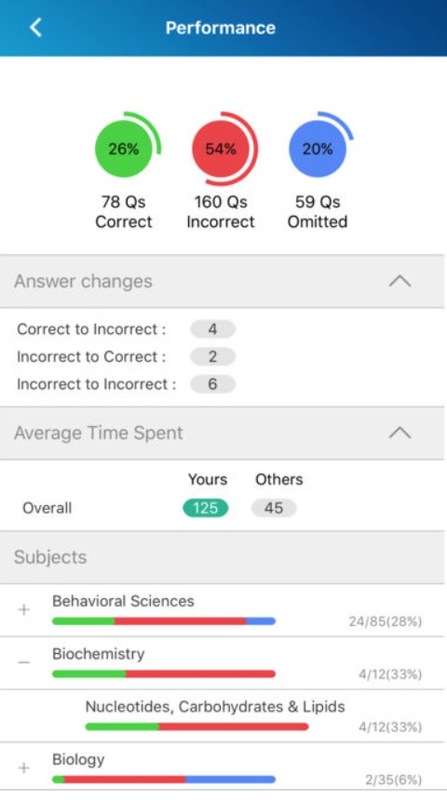 With UWorld you can get ready to see how your MCAT prep is coming along and rank yourself against your peers. Once you see yourself outperforming your peers or where you want to be you then are set to take the MCAT and can have confidence that you will do well. One of the doctors during my 3rd year of medical school had a daughter who wanted to get into medical school and the doctor remarked, “The hardest part of medical school is getting in”. This is the truth. 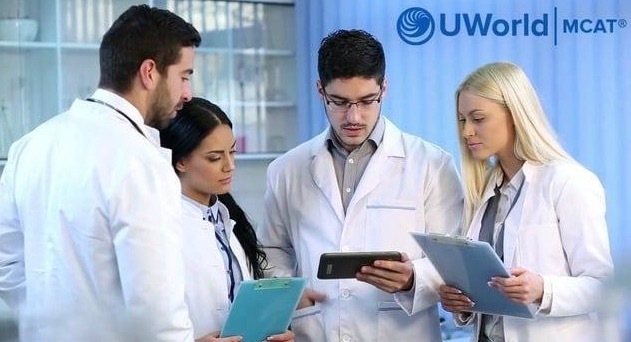 If you are serious about getting into medical school so you can become a doctor then your MCAT prep must include UWorld. This is the proven question bank utilized by medical students all over the world to pass their USMLE and if it works for use I can guarantee it will work for you on the MCAT. UWorld MCAT should be a no brainer at this point. Knowing the odds are not in your favor you need to give yourself every advantage possible and it begins with your knowledge base and doing problems that mimic what you will see on the real MCAT. Nothing else compares to UWorld! You’ll be thanking me later once you sit for the MCAT and your official MCAT score arrives and you smile knowing you are one step closer to the goal, the dream of becoming a doctor. Go ahead and start doing MCAT problems with UWorld! Plus, there's a completely FREE trial offer...No credit card required.